Video is a powerful promotional tool used by businesses to attract and engage with the customers. It has become a medium for brand to customer communication in B2B marketing. Most of the B2B buyers watch videos for researching the products and services before buying them. Knowing this many B2B digital marketers use video marketing in their strategy more than making use of content. Marketers make use of video in websites, blogs and social media platforms to increase awareness, build trust on brands, support customers & interact with them, create thought leadership plans and accelerate sales. Video has to be made informative, interesting and interactive for the B2B customers. Using content in video drives customers which in turn will result in sales conversion. When the information about a brand, products and services are depicted using video, it will have a great impact on the customers. Video reduces the time spent by buyers on knowing about a business, product or service. Visualizing a thing in the mind of customers plays a vital role than textual explanation. While you make a video for your business make sure that you portray the main purpose of video and use the right video format. Make your video to reach the target audience and give them a feel as they are experiencing the brand. Include comical pictures and humorous messages in the video which makes it more interesting for the customers to watch the video. The terms you use in the video have to be in a way to give solution for their needs. You can include emotional factors which may drive sales. Promote your video in related platforms. The impact that is created by video ads is more when compared to textual and audio based advertisements. 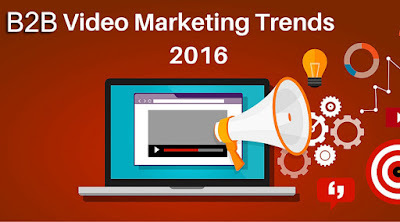 Video marketing has a major part in B2B marketing nowadays. So, B2B marketers have to make use of effective video marketing trends to drive more B2B customers and sales.